Since the advent of no-till in conventional row crop production, soil conservation and improvement aspects of no-tillage systems have attracted the interest of some organic farmers. The big question, of course, is how to do it without synthetic herbicides. The first big breakthrough occurred in the 1980s with the discovery that certain winter annual cover crops, notably cereal rye and hairy vetch, can be killed by mowing at a sufficiently late stage in their development—full head emergence with pollen shed in cereal grains, and full bloom in legumes. When winter annual cover crops at this stage of development are cut close to the ground, they generally do not regrow significantly, and the clippings form an in situ mulch through which vegetables can be transplanted with no or minimal tillage. The mulch hinders weed seed germination and seedling emergence, often for several weeks. This strategy is sometimes called "organic no-till," although continuous no-till is usually not feasible at this time for organic production of annual crops. In some initial experiments, the mulch effect of the mechanically killed cover crop was sufficient to delay the onset of weed growth until after the crop’s minimum weed-free period, which made postplant cultivation, herbicides, or hand weeding unnecessary (Fig. 1). Crop yields were commensurate with yields in control treatments in which the cover crop was incorporated. Tomato and some late-spring brassica plantings did especially well, and some large-seeded crops can be successfully direct-sown into cover crop residues. Such results, combined with research findings that no-tillage systems with cover crops can substantially rebuild soil organic matter and soil quality, stimulated widespread interest in developing organic no-tillage systems. Figure 1. Summer squash (left) and broccoli (right) were planted no-till into a winter rye–hairy vetch mulch. 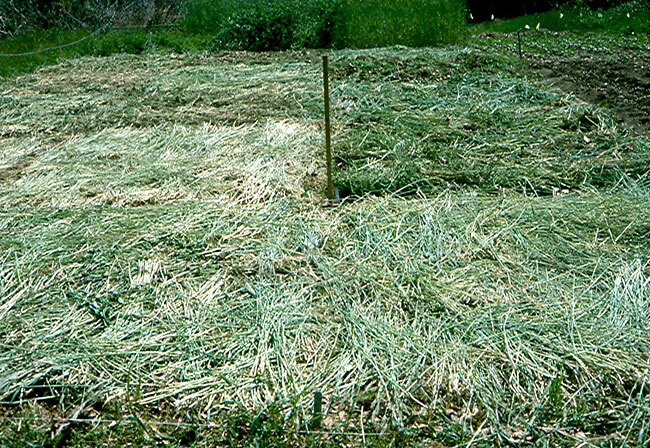 The cover crop generated over three tons aboveground dry weight per acre, and was either mechanically rolled (left) or manually cut with a sickle (right) and left in place, providing sufficient mulch to suppress weeds throughout the crops' minimum weed-free periods. No postplant weeding, cultivation, or herbicide applications were done in these crops. Figure credits: Mark Schonbeck, Virginia Association for Biological Farming. Several problems dampened the initial enthusiasm for organic no-till. First, results were inconsistent, and both weed control and vegetable yields sometimes fell short of the standard set by vegetables planted after cover crops were tilled in as green manures. Weed suppression failed particularly when cover crop biomass was insufficient to provide a thick mulch, or when many perennial weeds were present (Fig. 2). Figure 2. Canada thistle, an invasive perennial weed, easily emerged through a cover crop mulch to compete with this no-till planted broccoli. The farmer has since brought this infestation under control through a combination of timely tillage and high biomass cover crops. Figure credit: Mark Schonbeck, Virginia Association for Biological Farming. In addition, planting vegetables through mulch can delay vegetable growth and maturity, or promote problems with slugs, cut worms, or certain crop diseases. Lower soil temperature under the mulch slows mineralization of soil nitrogen (N), which can reduce yields of some crops, especially broccoli and cool season greens, which need a lot of N over a relatively short period of time. 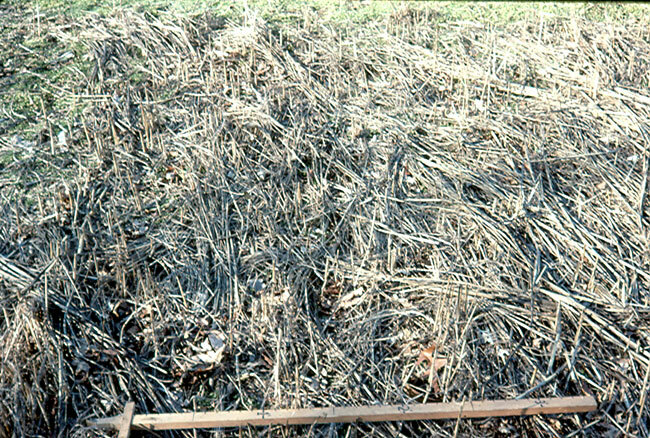 Furthermore, the randomly-oriented cover crop residues left by most mowers, scythes, and other manual cutting tools (Fig. 3), interfere with mechanical no-till transplanting, and most standard vegetable planters and transplanters do not function well in untilled soil. Figure 3. These winter cover crops were cut manually with a sickle prior to manual planting of the broccoli crop shown in Fig. 1. Mechanical transplanters, even those designed for no-till applications cannot operate effectively in randomly oriented residues like these. Figure credit: Mark Schonbeck, Virginia Association for Biological Farming. Finally, even when the cover crop residues eliminate early-season weed competition without hindering crop yields, later-season weeds almost invariably emerge, making tillage necessary after vegetable harvest to prepare a seedbed for the following cover crop. Thus continuous organic no-till is generally not practical, and some tillage is usually needed at least once per calendar year to manage weeds in organic annual cropping systems. In recent years, technical advances, combined with additional success stories from some working organic farms, have stimulated continued experimentation by farmers and researchers across the United States. 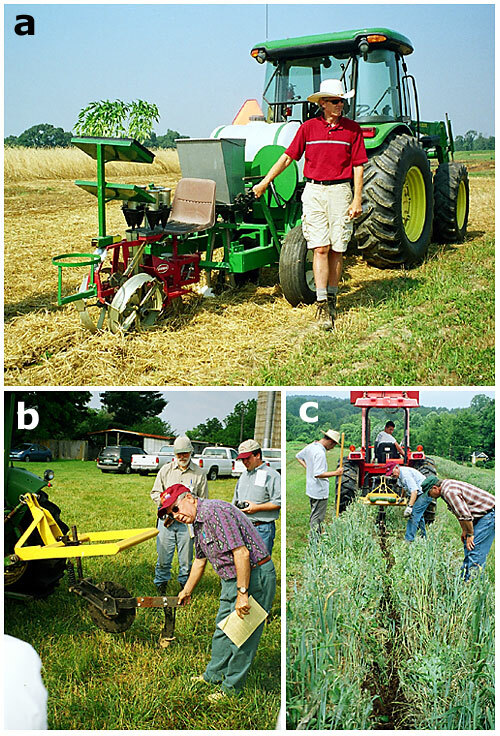 No-till transplanters, seeders, and planting aids (coulter followed by a shank to prepare a narrow, deep slot of loosened soil for planting vegetables) have been developed that permit mechanized applications (Fig. 4). 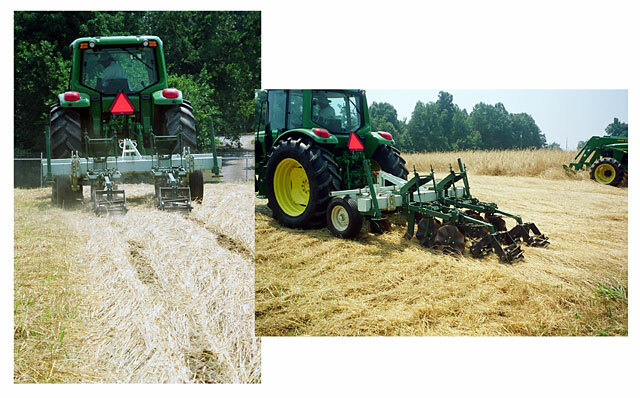 Whereas the randomly oriented residues of sicklebar- or rotary-mowed cover crops may cause clogging problems with these implements, other options such as flail mowing, rolling, and roll-crimping show promise (Fig. 5). The flail mower chops the residue fine enough for the no-till planters to penetrate the mulch to plant seeds or starts into the soil, though the finely chopped residues break down faster so that their weed suppression effect is shorter-lived. Rolled residues are oriented parallel to the direction of travel, thereby minimizing interference with mechanized planting. Figure 4. (a) Dr. Keith Baldwin of North Carolina Agriculture and Technology State University demonstrates a no-till vegetable transplanter, developed By Dr. Ron Morse at Virginia Tech and shown here in operation in a cover crop mulch at NCA&TSU's field station in Greensboro, NC. The planter parts residues, loosens soil in a narrow slot to 6–8 inches, plants and waters seedlings, and firms soil around seedlings. It is a major capital investment (at least $7000 per row). (b) Dr. Morse demonstrates a simple, inexpensive, light-duty no-till planting aid consisting of a coulter and shank to part residues and prepare a slot into which seedlings or large seed can be set manually or with standard planting equipment. (c) A no-till planting aid operating through still-standing cover crop prior to planting potatoes or large seeded vegetables. The cover crop is then mown just before the vegetable emerges to suppress weeds for maximum duration during the vegetable's growth. Figure credits: Mark Schonbeck, Virginia Association for Biological Farming. Figure 5. (a) Cover crop residues that have either been chopped into fairly small pieces by a flail mower, or rolled so that their stems are oriented parallel to the direction of travel, permit mechanized no-till vegetable planting or transplanting. The flail mower shown chopping the cover crop here can also be drawn through the field with the PTO turned off to roll the cover crop (left foreground); thus, it is a versatile tool for no-till cover crop management. (b) Flail mower (PTO off) rolling a dense stand of winter rye–hairy vetch to form a thick mulch with residues oriented to allow mechanized planting. Figure credits: Mark Schonbeck, Virginia Association for Biological Farming. Researchers have also found that winter cover crops are not the only ones amenable to no-till, no-herbicide management. Oats, field peas, and some vetches planted in early spring can be killed by mowing or rolling in early summer; some warm-season cover crops like soybean, foxtail millet, pearl millet, and sunnhemp can be similarly terminated about two months after seeding. The soil cooling effects of these mulches for midsummer and early fall vegetable plantings can be advantageous during hot seasons. Non-winter-hardy cover crops planted 60–90 days prior to anticipated frost-kill can form an in situ mulch that suppresses winter weeds and lasts into the following spring (Fig. 6). While attempts at no-till spring vegetable planting into winterkilled cover crops have been hampered by slow soil warming and/or inadequate weed suppression later in the spring, reduced tillage methods (strip till, ridge till, or shallow tillage) have given more promising results, with good vegetable yields and less problems with weeds compared to the no-till option. Figure 6. This sudangrass cover crop, planted in July on Cape Cod, MA, winter-killed to form an in situ mulch that suppressed winter weed growth. This photo was taken in February, at which time common chickweed had begun to cover unmulched fallow beds. Figure credits: Mark Schonbeck, Virginia Association for Biological Farming. Although continuous organic no-till does not yet appear feasible, significant opportunities exist to reduce tillage in organic production, thereby conserving soil organic matter and soil quality, and possibly improving weed management. Within this context, no-till cover crop management and vegetable planting can be effective tactics when used at certain stages of a crop rotation. By minimizing soil disturbance and exposure of weed seeds to light, rolling or mowing a cover crop rather than tilling it in helps to close the niche for annual weeds between a cover crop and the subsequent vegetable. Furthermore, surface residues of allelopathic cover crops like rye can maintain a shallow, weed-suppressive zone in the top inch or so of soil for some weeks. Larger seeded crops like beans, peas, and sweet corn, and especially transplanted vegetables, are quite tolerant to the allelopathic effects; hence the cover crop mulch acts to some degree as a selective herbicide. Transplanted tomatoes are especially tolerant to rye allelopathy, and respond positively to substances released by hairy vetch residues. In several studies, tomatoes grown no-till in rye–vetch have outyielded tomatoes in other systems, including plasticulture with drip irrigation. For small-seeded vegetable crops that are sensitive to allelopathy and require a fine seedbed, cover crops can be managed with ridge tillage, or strip tillage with sweeps ahead of the tillage implement to clear residues from crop rows (Fig. 7). This provides a clean seedbed within crop rows and leaves the mulch between rows to suppress weeds. Ridge or strip tillage also allows prompt soil warming within crop rows, which is important when the farmer plants warm season vegetables early in order to capture early, lucrative markets. Figure 7. Strip tillage prepares a narrow (~8 inch) swath through a cover crop mulch, allowing soil warming within the crop row while maintaining weed-suppressive mulch between crop rows. Figure credits: Mark Schonbeck, Virginia Association for Biological Farming. The cover crop is mature (heading/flowering with pollen shed), nearly weed-free, and has developed at least three tons (dry weight) aboveground biomass (solid stand three to four feet tall; cannot see the ground when viewed from above; clippings from one square yard weight about one and a half pounds when thoroughly dried). The cover crop includes a cereal grain or other grass that forms persistent mulch. Nutrient release from mulch decomposition approximately parallels vegetable crop nutrient needs, or sufficient supplemental N and other nutrients are provided. Weed populations are light to moderate, with predominantly annual broadleaf weeds. The soil is of light to medium texture, well-drained, and quick to warm up in spring. Moisture levels are adequate but not excessive, or can be supplemented by in-row drip irrigation. Organic mulches have historically been found to harbor natural enemies of important vegetable pests. Transplanted or large-seeded vegetables will be planted. Early vegetable maturity is not required. The farm has access to suitable equipment for rolling/mowing the cover crop and no-till planting through heavy residues. The cover crop is not mature, is weedy (more than 5–10% of the aboveground biomass is weeds), or has not developed sufficient biomass (looks thin, can see patches of bare ground when viewed from above, dry clippings from one square yard weigh less than one pound). 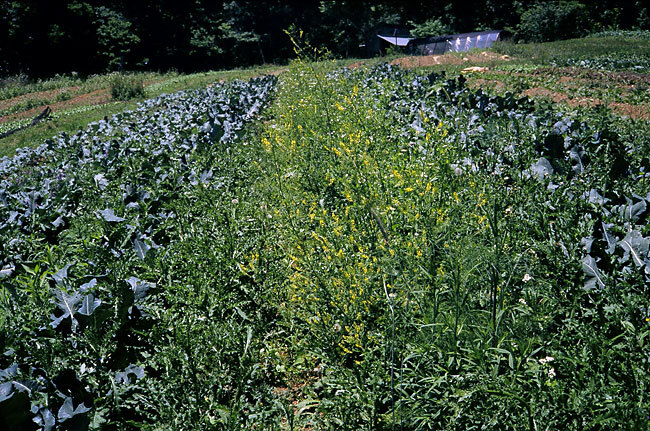 The cover crop is likely to decompose too rapidly to provide weed suppression (buckwheat or all-legume cover crops usually break down rapidly). Slower N mineralization in the mulched, untilled soil is likely to cause N deficiency in the vegetable crop. Invasive perennial weeds are present, the soil’s weed seed bank is large, or annual weed poplulations are high and dominated by grasses or large seeded species that readily penetrate mulch. The field has been converted from sod to annual production within the past 12 months (bits of sod can regenerate and become perennial weeds under no-till without herbicides). The soil is heavy or clayey, and tends to be slow-draining or slow to warm up, especially in wetter-than-normal years. Slugs, squash bugs, or other pests that are commonly associated with organic mulch have historically been a problem. Small-seeded vegetables will be direct-sown (sensitive to allelopathy, slugs, and other mulch effects). Quick maturation of tomatoes or other vegetables is desired for an early market. The farm does not have the equipment needed for planting vegetables through a rolled or mowed cover crop at the scale of operation. Compared to green manuring (soil incorporation of cover crops), no-till cover crop management slows the rate of N mineralization by keeping the soil cooler, and by leaving the organic residues on the soil surface. This can lead to N deficiency in a cool-season, heavy-feeding crop like spinach or broccoli that requires a lot of N in a short time, especially in heavier soils. On the other hand, the slower N mineralization under a no-till managed cover crop can be advantageous for summer vegetable production on sandy soils in warm climates. In one trial, summer squash yield doubled in mow-killed rye–vetch compared to squash grown after the cover crop was tilled in. The farmer suspects that the no-till system released N roughly as the crop required it, whereas much of the N released from the tilled cover crop leached away before the squash could utilize it. Terminating cover crops by mowing or rolling should not be described as an organic no-tillage system but as a tool or tactic that can be a valuable component of ecological weed management when used under the right circumstances. It can also be considered part of an organic reduced-tillage system, which is a more realistic goal. Watch these videos about 1) a high-residue, reduced-till system, featuring Ron Morse, Virginia Tech University, Blacksburg, VA, and Mark Schonbeck, Virginia Biological Farming Association; and 2) a living mulch system, featuring Helen Atthowe, BioDesign Farm, Stevensville, MT. These videos are from Part 2 of 'Weed 'em and Reap, a two-part DVD series showcasing tools and reduced tillage strategies for non-chemical weed management.